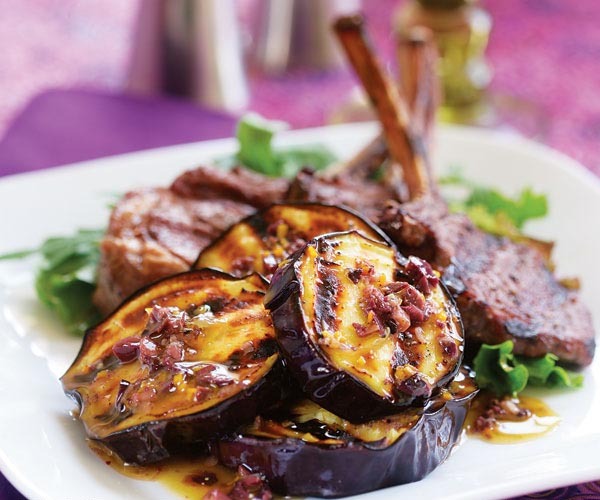 This is another variation on grilled eggplant, from the good folks at Fine Cooking. The densely flavored vinaigrette can be drizzled on lamb, fish or chicken, or on oven-roasted vegetables. Mash anchovy and garlic, adding a pinch of salt as needed to make a paste. Transfer the mixture to a medium bowl. Whisk in the olives, olive oil, orange juice, vinegar, and orange zest. Season to taste with salt, pepper, and more red wine vinegar, if necessary. Prepare a medium-high charcoal or gas grill fire or use a grill pan, set at medium-high. Brush both sides of the eggplant slices with olive oil and season with salt. Grill until golden-brown grill marks form, 3 to 4 minutes. Turn the eggplant and grill until tender and well marked on the second sides, 3 to 4 minutes more. The interior should be grayish and soft rather than white and hard. Just before serving, whisk the vinaigrette again and spoon it over the grilled eggplant—you may not need it all—or serve on the side. Garnish with chopped mint. This lovely dip comes from our friends at Fine Cooking, with slight adaptations. We are fans of anchovies, so for us, that ingredient isn’t optional. In this dip, the anchovy taste is very subtle, providing more of an umami layer, which makes the dish more compelling. If you’re uncertain about it, on your first try of this recipe, replace the whole, mashed anchovy filets with a teaspoon of anchovy paste, which will give you less of the anchovy. Position a rack 4 inches from the broiler element and heat the broiler to high. Line a rimmed baking sheet with foil and grease lightly with oil. Rub the eggplant all over with 2 T of the oil. 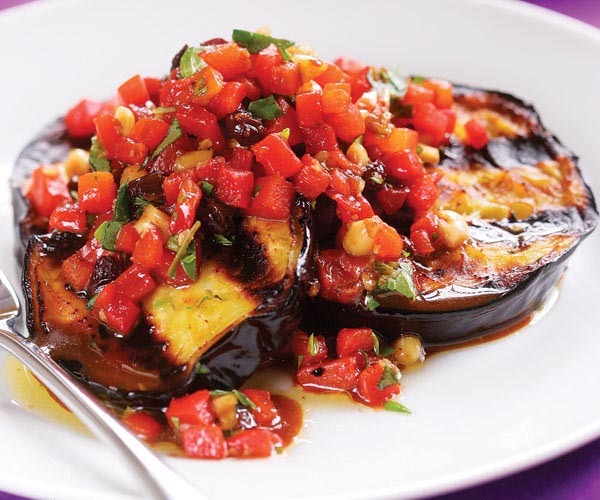 Arrange the eggplant, flesh side down, on the baking sheet and broil until the skin is charred and the eggplant flesh is very tender, 20 to 30 minutes. Meanwhile, if using anchovies, mash them into a paste with the side of a chef’s knife. Roughly chop the garlic, sprinkle it with a generous pinch of kosher salt, and mash it into a paste with the side of a chef’s knife. Transfer the anchovy and garlic pastes to a food processor and add the beans, 3-4 T of the oil, and 1 Tbs. water. Purée until smooth. When the eggplant is done, set it aside to cool briefly. Scrape the eggplant flesh from the skin and add the flesh to the puréed beans in the food processor, along with the lemon juice, chopped mint, and oregano. Pulse briefly to form a chunky dip. Adjust the seasoning with more salt, pepper, or lemon juice to taste. 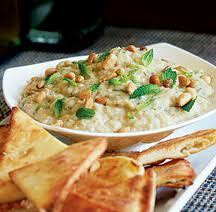 Serve sprinkled with the pine nuts and mint leaves, with toasted pita crisps on the side for dipping. With its silky texture and nutty flavor, eggplant always has been a favorite of ours. But the glossy-skinned nightshade fruit seems to attract as many detractors as afficionados – people either love them or just don’t get them. In fact, those who are confounded by eggplants are inevitably folks who’ve never had a chance to taste them done right. 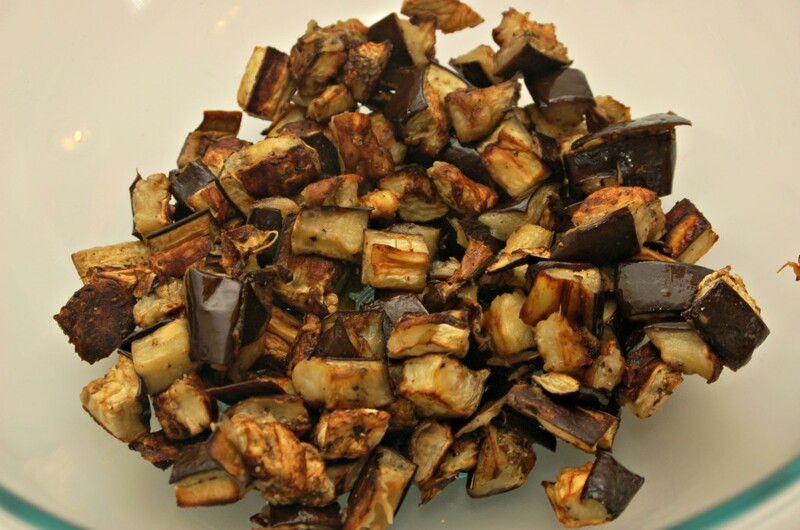 My absolute favorite way to make eggplant is simple: Cut them up in chunks, toss them with olive oil, chopped garlic and a smidge of salt, and roast them into the oven. 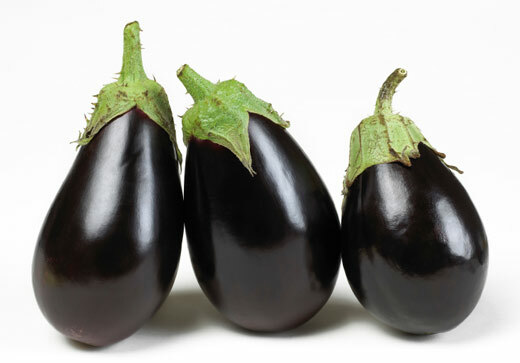 Of course, the eggplant has to be firm and not overripe, with its characteristic high sheen. It can be peeled or not peeled, depending on how you like it – I like the skin, so I don’t peel. Once roasted thus, the chunks can be used in all sorts of ways – or eaten as is (my fave). 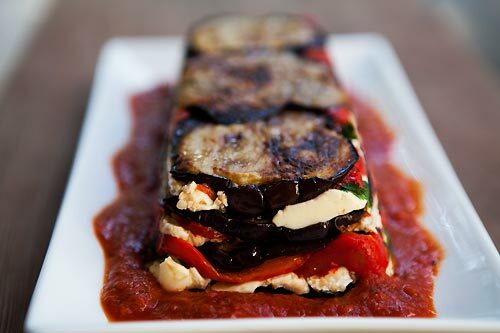 They can be tossed with pasta, to which you also add chopped herbs, such as parsley, mint or basil, a squeeze of lemon juice to bring out the sweetness of the eggplant, and topped with copious amounts of feta cheese. Or add the roasted chunks to a tossed salad, as did our host at book club a couple of weeks ago, resulting in our discussing the food way more than the book. For more ideas on eggplants, come back to this space over the next few days, or better yet, join us at the US Botanic Garden, at the foot of Capitol Hill in Washington DC or at Brookside Garden in Wheaton. This is eggplant month and we’ll be doing lots of fun things with them. 20-25 minutes until golden and cooked through. Serve hot or room temperature.